Looking for something to do this Saturday night? If you happen to be in the Bend, OR area then consider checking out The Save Wild Steelhead Festival. The purpose of this event is to unite anglers, filmmakers and conservation groups in an effort to educate the community on hard-hitting issues regarding wild steelhead, and motivate all to get involved. This multi-media event sponsored and hosted by Orvis, features the films “Raising The Ghost,” by Team FlyBoys and “Steelhead Yawning,” by Wahoo Films. 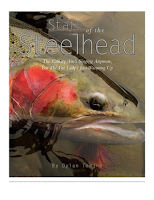 Writer and Patagonia Fishing Ambassador, Dylan Tomine, will make his “State of the Steelhead” presentation, accompanied by noted photographer Tim Pask’s images. The Festival will run from 6 to 8 pm on April 25th at the Orvis Store in the Old Mill District. Plan to arrive at 5pm to enjoy food, wine and beer while entering to win one of the many raffle prizes. All profits from the raffle and any donations will go to the local Wild Steelhead Grant. Additionally, 5% of “Raising the Ghost” DVD sales, Save Wild Steelhead t-shirts, bumper stickers and hats will be donated to organizations dedicated to the preservation of wild steelhead. If you do swing by, make sure to tell the hosts that El Pescador from Way Upstream sent you. Just back from the Bend, Oregon, Save Wild Steelhead Festival, where I had the privilege of reading my “State of the Steelhead” story to a packed house of 150+ people. In the spirit of competitor cooperation for a great cause, the event was held at the new Bend Orvis store, and they welcomed this Patagonia guy with open arms—nobody even said a word about my World Trout steelhead shirt! It was a fantastic event benefiting local conservation groups including Trout Unlimited, the Upper Deschutes Watershed Council and many others. The show featured Felt Soul Media’s “Red Gold,” Wahoo Film’s “Steelhead Yawning,” and FlyBoys’ “Raising The Ghost” along with speakers from the various local fish and water conservation orgs and yours truly. Lots of great food and raffle prizes and of course, this being a room full of anglers, a mid-show beer re-supply was required, courtesy of a local microbrewery. Also, photographer Tim Pask’s slide show, which he’s generously donated to accompany my reading (and keep people from falling asleep while I drone on and on) was a big hit. I think the most gratifying part of the whole gig, though, was the incredible level of enthusiasm, engagement and support from everyone in the audience. And it occurs to me that getting people fired up to get involved in saving the fish they love might be just as important as the money raised. Doing both in one night is even better. Nice work Mr. Ambassador. It sounds like things went well. Adults like to have stories read to them too. Hopefully we can have a happy ending to the saga of wild steelhead.